Grove City Parks and Recreation works to foster physical, mental and cultural development in community members through all stages of life. From team sports and gymnastics to nature experiences to crafts, children as young as 2 years are exposed to a variety of experiences as they grow, learn and develop personalities while discovering their interests. Programs are detailed in The Source section of Discover Grove City magazine, published six times each year. 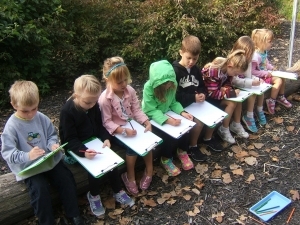 RecSchool, Grove City’s preschool program based in Gantz Park, uses nature and play-based activities to encourage learning and prepare children ages 3 and 4 for school. The before- and after-school childcare program, P.A.R.K., offers a safe, active place for children to be when not in school where they stay active physically, mentally and socially. After-school P.A.R.K. operates conveniently at six South-Western City School District (SWCSD) elementary schools serving kindergarten through grade four. Before-school P.A.R.K., which also serves intermediate school students, is located in the Kingston Center and includes transportation to schools not within walking distance provided by the SWCSD Transportation Department. RecSchool is a child-centered early childhood program for pre-kindergarten children operated by the Grove City Parks and Recreation Department and licensed by the State of Ohio. The RecSchool staff is made up of established professionals with a variety of early childhood educational backgrounds. The program’s philosophy recognizes that children learn best through meaningful play, and the curriculum supports cognitive, physical and social development through art, literacy, music, math and science experiences. This nurturing environment prepares students for successful experiences in school and beyond by fostering competence, social skills, independence, creativity and a love of learning. RecSchool is held at Gantz Barn in beautiful Gantz Park, 2255 Home Road. The program operates from September through May. Half-day classes are offered two or three days per week with morning classes meeting from 9-11:30 a.m. and afternoon classes meeting from 12:30-3 p.m. Children enrolled in the program must be 3 years old by Sept. 30 of the year they enter the program. Registration for each school year begins the previous February. All parents interested in registering for the program must observe a class and meet with the RecSchool supervisor. Download the April RecSchool newsletter. To receive registration information or to be placed on the mailing list, please call Michele Demmy at 614-871-6330. At Playgroup, 2-year-olds and their parents enjoy an hour of free play, singing, stories and art. Classes are held at the barn in Gantz Park, 2255 Home Road. This program operates September through May with two different Friday morning class times: 9:15-10:15 a.m. and 10:30-11:30 a.m. Call Michele Demmy at 614-871-6330 for additional information or to be placed on the Playgroup mailing list. Playgroup enrollment for 2019-2020 opens Wednesday, May 1. Programmed After-school Recreation for Kids (P.A.R.K.) is a daily after-school childcare program for children in kindergarten through fourth grade. The program takes place in the gymnasiums at Bolton Crossing, Buckeye Woods, J.C. Sommer, Highland Park, Monterey and Richard Avenue elementary schools, and runs from 2:40 to 6 p.m. every day the SWCSD is in session. The program does not operate when the SWCSD is closed for inclement weather. Qualified childcare providers staff each site. P.A.R.K. provides planned cooperative games, fitness, indoor and outdoor activities, free art, special interest activities, stations, free-choice activities and much more. Children should bring a snack to P.A.R.K. daily. Parents of participants are responsible for reading and abiding by the information contained in the Parent Handbook. To ensure proper care of your child, a number of forms must be completed and returned to the office before the child may participate in the program. 2018-19 After-School P.A.R.K. Information and Forms Each P.A.R.K packet includes: Parent Agreement, Emergency Medical and Walking Permission forms and Tuition Payment slips. The Before-school elementary and intermediate, Bolton Crossing, Buckeye Woods and J.C. Sommer sites are full; applicants are being accepted for the waiting list only. Download the 2018-2019 PARK Registration Form. Waiting lists for the sites are maintained throughout the year with students added on a first-come basis as space becomes available. A packet of forms, including emergency contact information, must be completed as part of the registration process. Enrollment for after-school elementary and before-school elementary and intermediate opens to the public 8 a.m., Wednesday, May 8. Current participants enjoy an early registration period. Students are added on a first-come basis as space is available. A packet of forms, including emergency contact information, must be completed and a $30 non-refundable registration fee must be paid as part of the registration process. P.A.R.K. Before-school program creates a safe, fun environment for children in the morning hours before school starts for elementary (kindergarten through fourth grade) and intermediate (fifth and sixth grade) school students. The program meets at the Kingston Center from 6 a.m. until it is time for transportation, and includes supervised care and recreational activities as well as breakfast. This program meets every day the SWCSD is in session; it does not operate when the SWCSD is closed for inclement weather. Transportation to the child’s school is provided by the SWCSD Transportation Department for students enrolled at Bolton Crossing, Buckeye Woods, Highland Park, Richard Avenue and Monterey elementary schools, and Holt Crossing intermediate school. Before-school P.A.R.K. staff walk J.C. Sommer elementary as well as Park Street and Hayes intermediate school students to their respective schools. Each P.A.R.K packet includes: Parent Agreement, Emergency Medical and Walking Permission forms and Tuition Payment slips. Summer P.A.R.K. is a full-day childcare program offered weekdays from 7 a.m. to 6 p.m., Monday through Friday. The program offers cooperative games, fitness, indoor and outdoor activities, free art, special interest activities, on-site mini-camps, stations, free choice activities and more. Participants also take weekly field trips, including excursions to the Big Splash Family Aquatic Center. 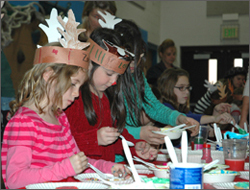 The program is available for children in kindergarten through fourth grade; participants must have completed kindergarten before starting the program. Summer P.A.R.K. is conveniently located at Highland Park and Richard Avenue elementary schools, and is perfect for children on parents who live or work in Grove City or surrounding areas. The 2019 program operates for nine weeks, Monday, June 10 through Friday, Aug. 9. There is a $100 non-refundable registration fee. Total tuition is $1,284, divided into four payments. Registration for 2019 Summer P.A.R.K. opens to the public Tuesday, April 16, and must be done in the Parks and Recreation Office in the Kingston Center. Complete a registration form and pay the $100 deposit to complete registration. For those registered for 2019 Summer P.A.R.K. program, the first payment and completed permission slips and emergency medical forms will be due to the Parks and Recreation Office by Friday, May 17. Children develop self esteem, independence and social skills through highly active games, outrageous play, special activities, free choice art and adventurous off-site trips at Summer PlayZone. This fun, outdoor-focused program takes place at the Kingston Center, 3226 Kingston Ave., and runs for eight weeks from 9:30 a.m. to 2:30 p.m., Monday through Thursday. Participants must have completed kindergarten through fourth grade before taking part in the program. 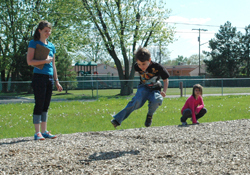 Registration for Summer PlayZone is part of normal class registration for May-June offerings, which opens Monday, April 29.